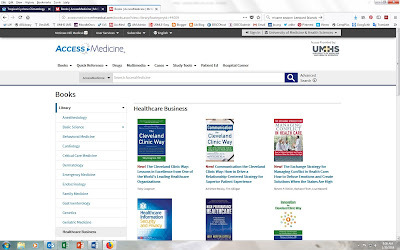 McGraw Hill has announced the addition of 14 new Healthcare Business Titles to the AccessMedicine platform. These titles will appeal to practicing clinicians, healthcare administrators, residents, fellows, and medical students. "The focus of these books ranges from softer skills, such as communication and conflict resolution, to leadership and management training, to quality improvement and patient safety projects with Lean Six Sigma, to healthcare technology and privacy issues." Please remember that AccessMedicine also includes a series of ten Healthcare Systems Titles on the site, covering topics such as quality, safety, policy, and ethics. UMHS Students: You where all sent your personal logins to AccessMedicine at the beginning of your first semester at UMHS. If you have any problem signing into this resource, please contact the Library.